So, is everyone feeling festive yet? If you work in a theater in America, chances are 64% that you are about to open your Christmas show. (Statistic not based on fact) Whether it be 'A Christmas Carol' (yay, public domain! ), 'The Best Christmas Pageant Ever', a Nativity play, or some multi-denominational holiday extravaganza, you're probably picking glitter and pine needles out of your clothes at the end of each day. Well, here in the Fake-n-Bake kitchen, we are no exception. Now, I feel like I should say that I love our beautiful production of 'A Christmas Carol,' but one does tire a bit when most of the notes involve bow fluffing and holly gluing. 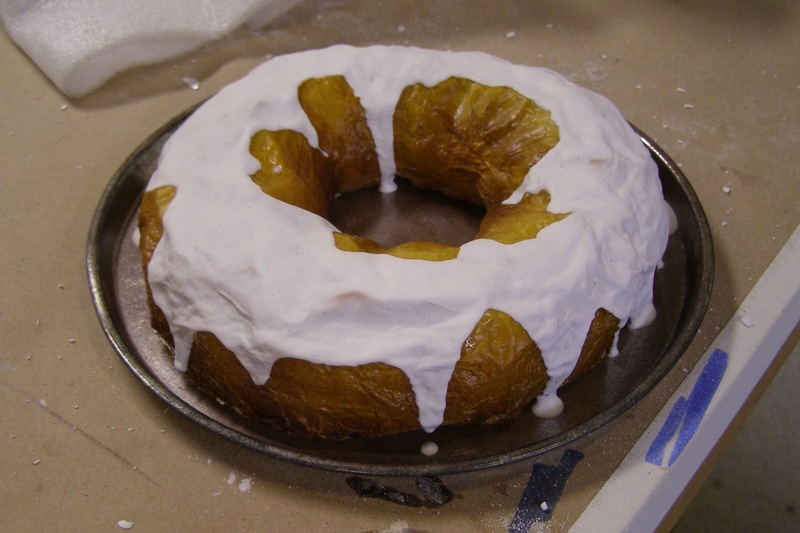 This prop is a rebuild of a smaller coffee cake that wasn't reading well. 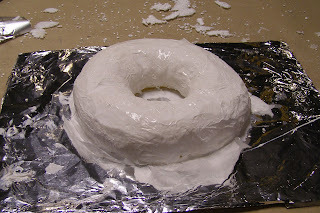 I started by making a ring of Great Stuff foam. Now, I'm having a bit of a falling out with Great Stuff right now (See upcoming posts on life casting traumas) but I like using it for baked goods because it is lightweight, readily available, and it carves well. Once the Great Stuff was cured, I trimmed away the funky bits to smooth the shape a bit. 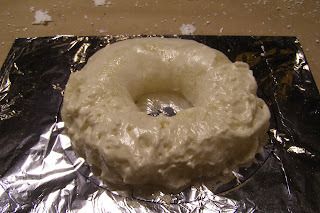 Then, I did a papier mache treatment over the foam, to give it a more 'pastry like' surface to paint. I used tissue paper and white glue for this. Once the papier mache was dry, I painted the cake with Design Master spray paints. The Honey Stain and the Glossy Wood Tone worked to give the cake that fresh baked golden look that looks so good on stage. The icing is made from a mixture of Acrylic Caulk, Acrylic Gloss Medium, and Water. I drizzled it over the top. The first time, I put on way too much and had to wash it off. The next time was a little bit better, though I would have liked to have achieved skinnier drips, so I'll have to practice that in the future. I also could have spent a bit more time and attention to a more symmetrical coffee cake, but as my real coffee cakes usually turn out asymmetrical also, I thought I'd let it go. 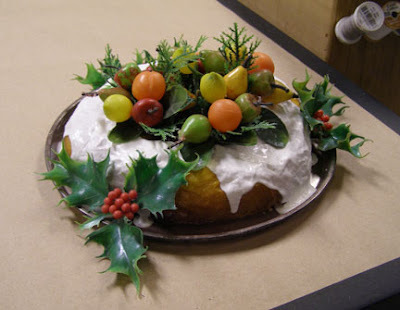 Then, I glued it to the plate, and hot glued a metric buttload of fake holly and fruit picks to it, and WAH-LAH! Christmas like Charles Dickens intended it! Just wanted to say thank you for all your posts, I love seeing everything you make! I check here nearly everyday for updates. Very inspiring! How sweet of you to say, thank you! I try to update once a week, but as you can tell, I've been busy lately. I'll try to be more on top of things. I'm so glad to know there are people out there enjoying the blog!